Leviticus is basically, stripped down to the simplest description, a book of law. Moses, the representative of the law in the Biblical context, wrote this book. The title of the book basically refers to the Levites, the tribe that priests come from. There are many ‘do’s and ‘do not’s in this book, and a lot of very ritualistic procedures – especially instructions for the priests. Modern Christians find it hard – or even unnecessary to reconcile themselves to the commands in this book. Certainly, much debate has been made over Law versus Grace, over the Old Testament commands versus the New Testament commands. Let me first state that I’m not going to go into that, for I am far from qualified to enter such a difficult argument. I’d rather pray more about other things than spend time arguing when I’m not equipped to. There are millions of laws in the first five books of the Bible (that, if you realise, is an exaggeration) – I’d think it necessary, for what Moses was doing was practically nation-building. And when a new nation tries to build itself, what’s the first thing it must do? Set a lot of laws, of course. It is true that many laws that existed in the Old Testament were altered or abolished in the New Testament. I won’t go into that, but there are obvious ones, like regarding clean or unclean food. But there are also those that were never changed – Jesus and the apostles quoted quite a number of verses from the Old Testament. Leviticus was referenced 107 times by 15 books in the New Testament. Among those, one of them would be Leviticus 19:18, which consists one of the more important commands of Jesus in the New Testament. Today we will examine this old law bit by bit, part by part, and savour the fact that it still exists despite all the years that have come and gone. And now, dear lady, I am not writing you a new command but one we have had from the beginning. I ask that we love one another [2 John 1:5]. The second is this: ‘Love your neighbor as yourself.’ There is no commandment greater than these [Mark 12:31]. A new command I give you: Love one another. As I have loved you, so you must love one another [John 13:34]. If you really keep the royal law found in Scripture, “Love your neighbor as yourself,” you are doing right [James 2:8]. And he has given us this command: Anyone who loves God must also love their brother and sister [1 John 4:21]. I see it appropriate to merely list the New Testament verses that referenced this Old Testament verse without having to add any opinions of my own. There are a lot we can analyse, like how Leviticus 19:18 has influenced the New Testament writers, or how the verse has evolved over time, but I think the essence of the meaning of this verse never changed, and I think ideas like love your neighbor as yourself has been talked about sufficiently through the other verses, and will continue to be talked about adequately in the future. It is a major commandment of Christ in the New Testament, but it originates from the Old Testament laws. It might be significant this verse in Leviticus was clearly merely centred on the Israelites only – do not… your own people; and love your neighbor – and if you would notice, there was no longer such a restriction so clearly stated in the New Testament. 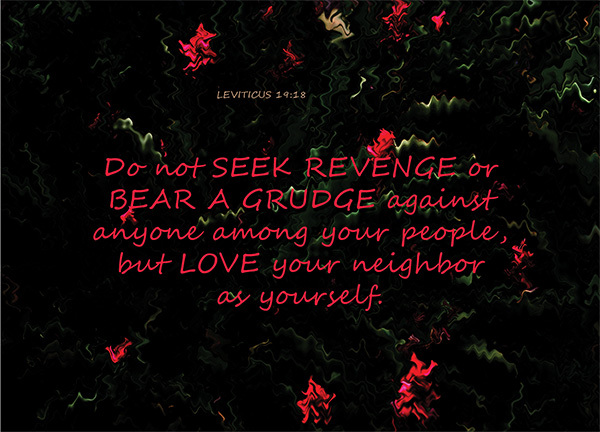 Do not seek revenge. It stops there in Rom 12:19. It doesn’t suggest that it’s okay to seek revenge against foreigners anymore. And Jesus clearly taught to love your neighbor as yourself, and to love your enemy as your neighbor. Things do change. In fact, the standards were raised higher and not lower, contrary to popular belief. Leviticus is a very, very old command. The time of Moses was probably around 1.5 – 2 thousand years before Christ. That’s close to 4 thousand years ago. It’s amazing how such an old command has survived through the ages and still stands as an important command for us today. Age has not withered it. In fact, it has become ever more so important that we keep to it.